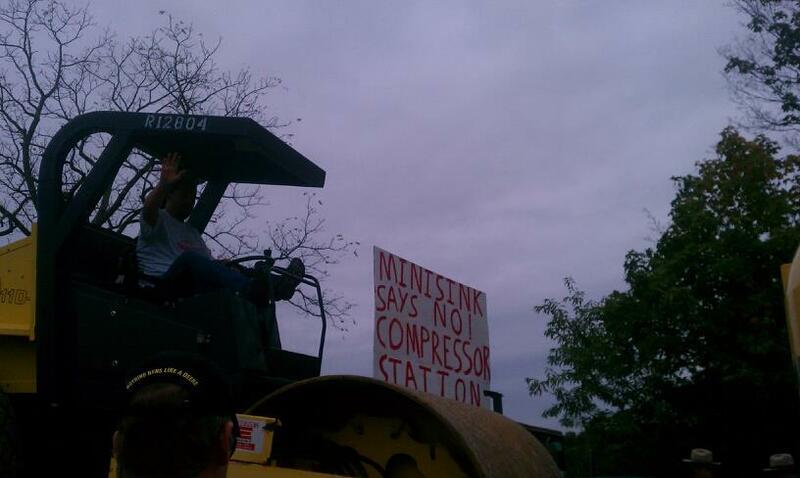 Minisink, NY gas compressor station site was successfully blockaded for over half the day. On October 1st, Millennium Pipeline Llc began construction on a controversial compressor station in Minisink, NY. The facility, which will emit 61,000 tons of toxic material annually, is meant to increase capacity for storage and delivery of fracked natural gas from Pennsylvania and eventually upstate New York. The facility is located within ½ mile of close to 200 homes, and within 1 mile of a nature preserve, an animal sanctuary, and numerous organic and small farms. The federally endangered Indiana Bat has multiple possible roosting sites proposed to be cut down in the coming days. Residents are currently entering their 5th day of resistance to this project, which so far has resulted in 2 arrests and numerous work slow-downs and disruptions. Residents in western Orange County began fighting the project over a year ago, and have taken every legal step possible. FERC (the Federal Energy Regulatory Commission) approved the project with a 3 to 2 vote, unprecedented in their history as a rubber stamping revolving door for industry. The split decision was the result of an alternative site proposed by residents, which would involve the expansion of an already existing compression facility. With their decision, FERC confirmed what we already knew, that when the interests of industry come up against community, the government is no ally. The gas industry has plans to turn Minisink and Western Orange County into a hub for operations, with another compression station and an $800 million dollar natural gas power plant already in the early stages of regulatory approval. The community, however, has no plans to bow to industry or FERC. They have responded with a promise for daily action. On day 1, the site was successfully blockaded for over half the day, and only one resident was arrested (he was released within 2 hours with a ticket for disorderly conduct). On day 2, there were numerous work stoppages as a result of soft blockades (one brave individual was arrested), vehicular intervention, and the actions of one resident who jumped on top of a piece of heavy machinery (and amazingly managed to avoid arrest). On day 3, around 75 people, including many children and local families marched from the site through town and back again to continue to spread awareness about the toxic compressor station and strengthen resolve. On Day 4, a flash mob stopped traffic to the site for about an hour, with CBS news coming to cover the story. As we approach the 5th day, it remains to be seen how this campaign will escalate in the near future. One thing is certain; no one in this area saw resistance of this magnitude coming. Hopefully this signals a sea change in the way things have been in the Hudson Valley. This bio-region has suffered enough suburbanization, gentrification, pollution, and downright dirty dealing. From Indian point (the nuclear plant with no evacuation plan) to PCBs, natural gas infrastructure to green-washed incinerator projects, we are here to let it be known that the heyday of industry is over. No compressor station! No compromise! Long live the Indiana Bat! The next day of action is this Saturday (10/6/12) with another march, followed by a direct action training presented by Hudson Valley Earth First!